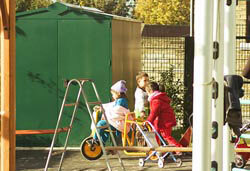 Asgard Steel Sheds are made of strong, heavy, galvanized steel, and provide the most secure storage for schools, nurseries and playgroups. All offers below include VAT, delivery, full assembly and anchoring of the unit. All units come with a 10 year warranty as standard. Please include offer number and colour & your purchase order number, we will invoice you. 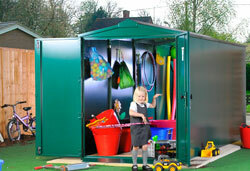 "Asgard sheds have given us peace of mind as we know our equipment is safe and secure and is easy for the children to access at a moments notice"
"We are very happy with the quality of the Asgard sheds we now have on site. 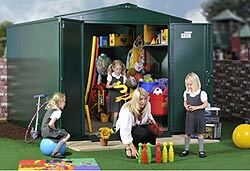 They were delivered and erected swiftly and professionally"
"Our Asgard shed means we can store our equipment in one place that is safe, secure and easily accessible for both children and staff"
If you require any assistance at all, please call us on 0161 222 9980. £1,454.00 excl VAT. A saving of £124.00 on MRP. 11.28 cbm storage. Unbeatable Price! £1,508.00 excl VAT. A saving of £170.00.00 on MRP. 9.11 cu.m. storage. A saving of £214 off MRP. 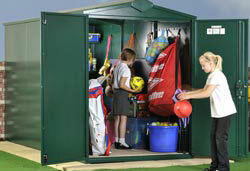 £579.00 excl VAT. Double door access! £39.00 off MRP. Excellent Value! £704 excl VAT. A walk-in unit with storage shelves to both sides and set of hooks. £122 off MRP. 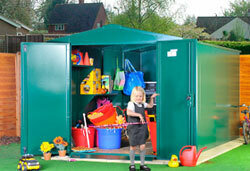 £596.00 excl VAT. 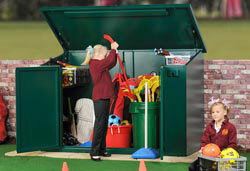 Reinforced double door access with an easy-lift gas controlled lid. £120.00 off MRP. £433.00 excl VAT. 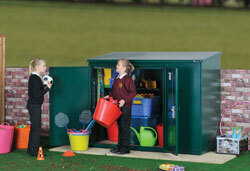 A saving of £25.00 off MRP, 1.9 cu.m.storage. Great Value Storage. £1,712 excl VAT. Just over 15 cu m of storage. Very useful where width is at a premium. 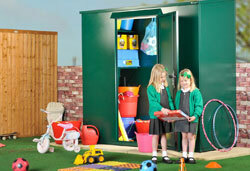 Save £170.00 off MRP. A saving of £175 off MRP.